I was eagerly awaiting Rowan Coleman’s latest novel, and when it finally arrived in the post, I was in no way disappointed! To me the novel feels very different from some of her earlier offerings, if someone had told me that this was the same author who wrote ‘The Baby Group’ (my favourite of Rowan’s novels) I might not have believed them. 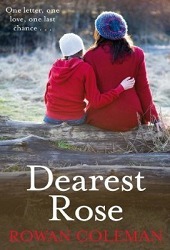 Nevertheless, I liked Dearest Rose just as much. The thing that stands out for me is how real the characters and the storyline seem to be. I feel as if the events that unfold could’ve been happening to someone I knew, a friend of mine, and therefore found the book very easy to relate to and equally as easy to read. The story centres around Rose and her daughter Maddie and the journey they embark upon when they find themselves suddenly removed from coastal Kent and plonked in a Cumbrian town which is both familiar and unfamiliar at the same time. There are plenty of other characters thrown into the mix, each bringing their own complications, humour and joy to the storyline. The thing that I found really refreshing in the plot of this novel was the way that they relationship between the mother and daughter was explored. I can’t think of another book where this relationship has been exposed as much. It tends to be that yes the mother/daughter bond is touched upon, but generally other characters are involved, a father, or other siblings, but in the case of this novel there are lots of scenes where the two characters are alone, or else the mother is focusing entirely on her daughter, worrying about her or addressing problems in their own relationship. This is the perfect book to be reading at this time of year, it goes especially well with a nice hot chocolate on a Sunday afternoon. Even if you haven’t read anything else by this author, I think that there is something for everyone in this book so it is definitely worth a try. And if you are already a fan of Rowan Coleman’s delicious writing, you won’t be disappointed what her latest novel has in store for you! This sounds like a very sweet book! I enjoyed your review! Catriona writes great reviews!! She is always so thorough. Ohh! I love the Mother/Daughter relationship!! I think I need to move this to my "Must Read" list!!! me too. I've not read chic-lit in awhile but I might just have to!